It’s always a treat to get a behind-the-scenes tour. This week I was lucky enough to be invited to the preview of Gardeners’ World Live. So I found myself wandering around the show gardens, instead of pressed up against the boundary ropes and fences surrounding them. Here’s a few highlights from my special day out. Castles,with their history and romance, inspired the design. I loved the ruins with trickling waterfall, wild roses, foxgloves and ferns. The pink spires at the base of the waterfall are purple loosestrife, Lythrum salicaria. 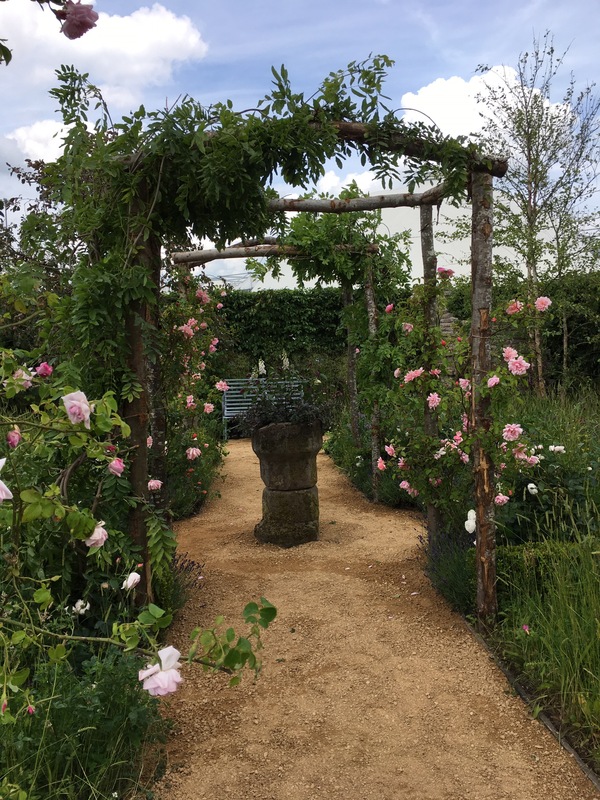 A rustic pergola was swathed in Albertine and Mortimer Sackler roses. Walking through the garden, the scent was so delicious on a hot sunny day. Salvia Love and Wishes is the focal point plant in the old stone urn in the centre. CED Stone supplied the Golden Amber pathway material- a self-compacting gravel. It makes a beautiful and affordable surface for cut flower gardens and veg plots. One stand-out feature for me was the white Desdemona rose. 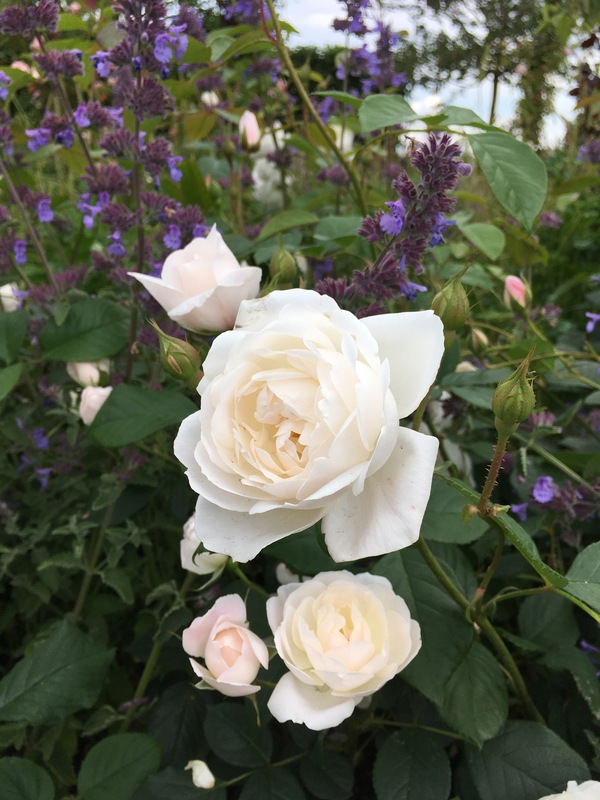 Bred by David Austin, it is exquisitely beautiful with peachy pink buds opening to pure white blooms. It has a strong perfume and flowers until November. Grows to about 4ft and is disease resistant, plus the flowers cope with rain. The designer has used it as a low hedge underplanted with Nepeta Six Hills Giant. I spotted vetches, yellow rattle, clover and crested dog’s tail grass in the wild flower turf. 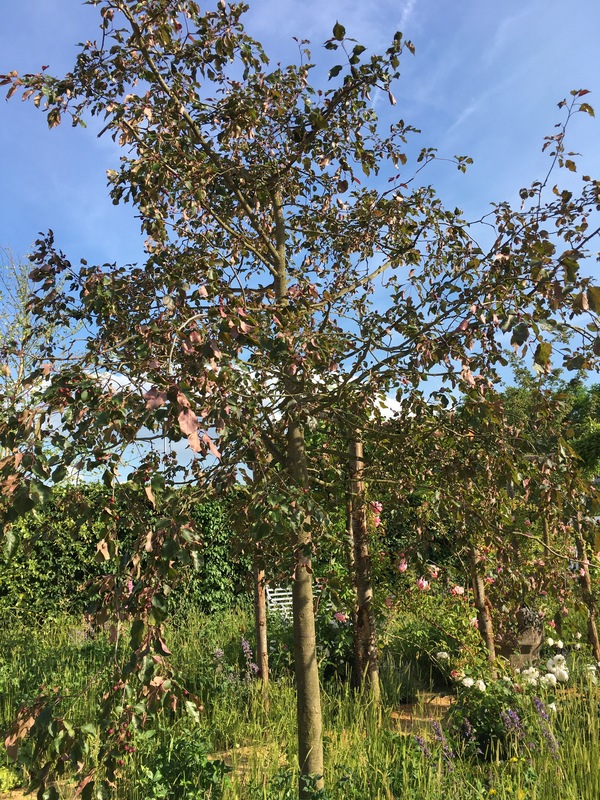 The focal point tree is Malus Rubra- brilliant for spring blossom, autumn crab apples, and attractive plum-coloured leaves all summer. 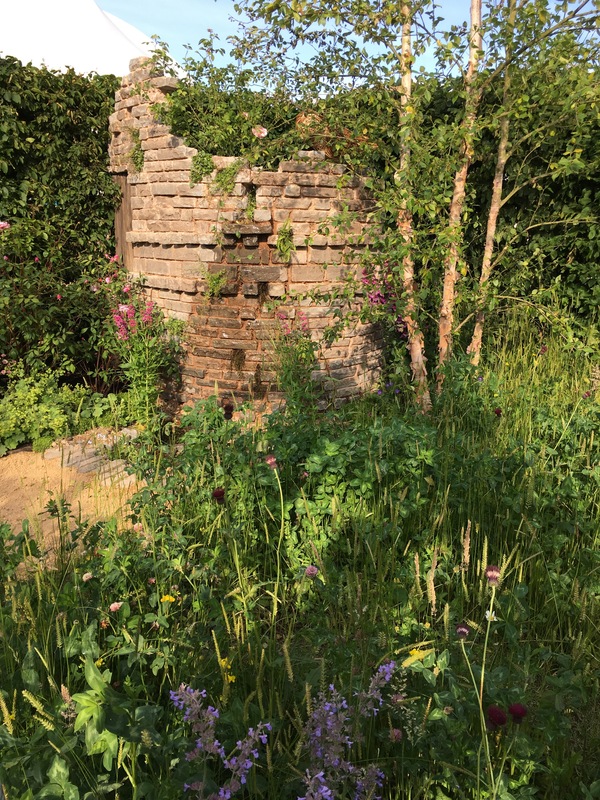 The multi-stem tree used in the garden looks like a river birch, with peeling bark blending in with the colour of the ruins alongside. 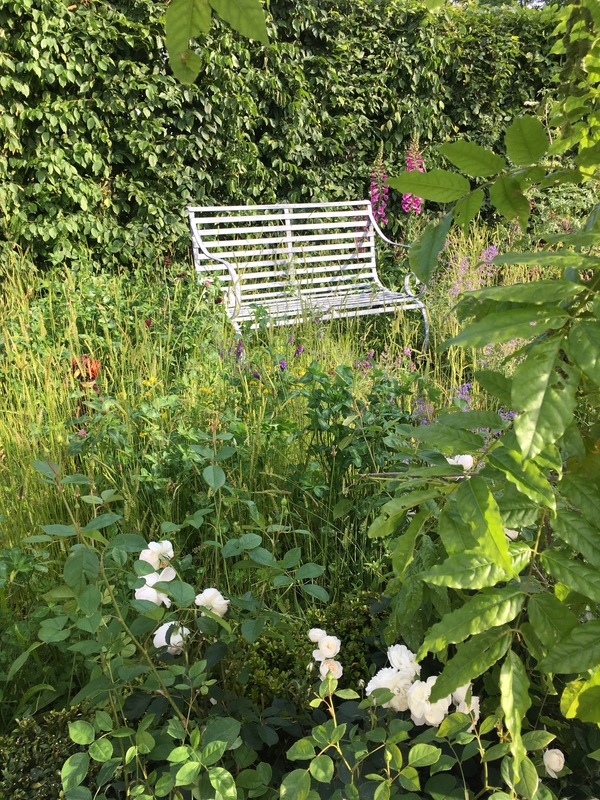 Winning my prize for the garden I’d most want to roll up and take home – and providing the garden bench I would most like to recline on, a show garden with many elements worth “borrowing.” A triumph of great design and plant knowledge. Supporters: Parkers Building Supplies,CED Stone, Home and Garden Ironworks, Woody Fox Willow, Hilliers, Rolawn. I hope you’ve enjoyed my behind-the-scenes tour. If you are going to Gardeners’ World Live, let me know which gardens you love this year, and which is your favourite feature. There’s plenty to see…. and I haven’t even mentioned the floral marquee. That’s a wonderful place worthy of a blog post all on its own. More to follow! The show looked great on GW last night. 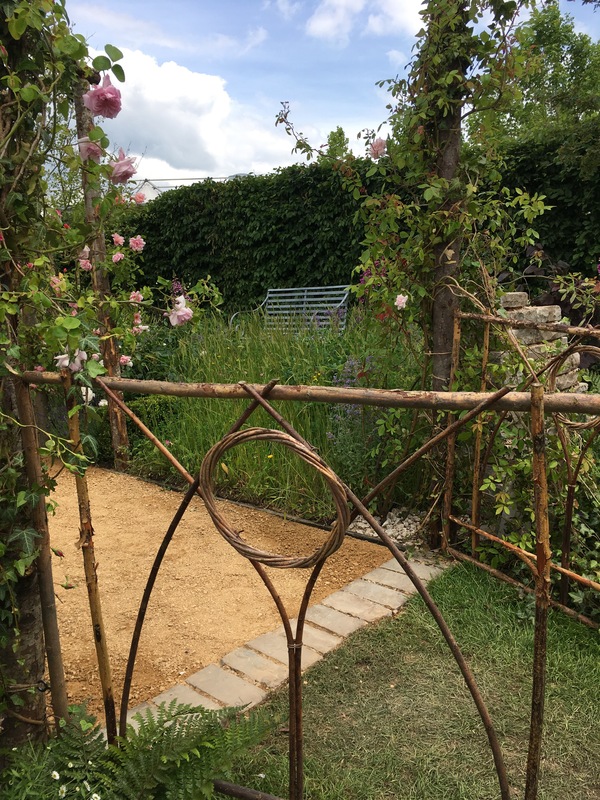 It is a pity the BBC did not devote more than one programme to its own garden show, there appears to be so much more to see. Garden. I love all the flower choices and the path sets them off beautifully. A great winning design. A most enjoyable post and lovely pictures. I’m generally not a fan of many show gardens but this one looks and sounds like my kind of garden, and I especially like the bench. It was really inspiring. Such a lot of effort had gone into making the show gardens, and there were as many plants in the floral marquee as at Chelsea. Much easier to get to than Chelsea too. Thanks for the tour, and for your level of description of the design. Gorgeous! Thank you for reading and for taking the time to get in touch. I must admit, it was a garden that drew me back several times. It was a calm oasis in the midst of a hot, busy showground.